Dunhill Large Box Pouch. .. This Dunhill roll-up tobacco pouch is made with real craftsmanship shown by the exquisite stitchi.. Traditional White Spot Roll-up; 2 gussets extend the opening for easy filling; extremely supple l..
A large rotator tobacco pouch from Dunhill's White Spot collection. ..
A large roll-up tobacco pouch from Dunhill's Terracotta collection. ..
White Spot Zip Pouch – neat, with rounded corners for comfort. Size; 160mm x 90mm. ..
Peterson Avoca Roll Up Pouch. 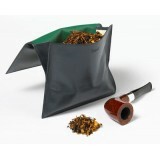 ..
Peterson Avoca Roll-Up Pouch, Paper Slot. ..
Peterson Avoca Stand Up Box Pouch. ..
Part of the Peterson 'Classic' collection this button-up tobacco pouch with rubber lining to help..
Part of the Peterson 'Classic' collection this button-up tobacco pouch with rubber lining to keep..
Part of the Peterson 'Classic' collection this roll-up tobacco pouch is soft and comfortable to c..
Peterson Stand Up Box Pouch in hide, with red interior. ..